Michelle wanted a site that was feature rich, always up-to-date, and represented his image and talents. 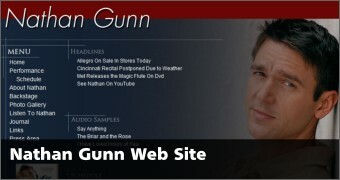 Working closely with John Bonadies a site design emerged which was then given to GlennWeb.net for implementation. We templated the design using PHP/CSS/Savant and integrated it with a custom CMS that supports site features specially geared toward musicians. These features include a Performance/Appearance Calendar, Journal (blog) entries, a Photo Gallery, News items, Albums/Tracks/Media which are integrated throughout the site, editable Page Content, and external Site links. All of these features are easily managed from anywhere through the custom browser-based CMS.